Thank you Netgalley, Poppy, Bloomsbury, Tanglewood Press, Simon and Schuster, Jennifer Estep, and Lisa Bergren! I can't even express how much I am IN LOVE with this series! This is *THAT* book! I'm sort of on the fence about The Magnolia League, but I thought I'd give it a try. It's actually really short (229 pages), and you know how much I love short books. Plus, secret societies and hoodoo? Yep, I could read that. I've heard some iffy things about it unfairly stereotyping the South, and that's just not cool so I'm not sure anymore. I was actually really happy to see The Poisoned House on NetGalley. I had added it to my TBR a long time ago but sort of gave up hope of ever finding a copy. I wasn't even sure if it was published in the US (I'm still confused). So when I saw it on NetGalley I snatched that sucker up. A tyrannical housekeeper, a lord plagued by madness, hauntings, a killer in their midst, a wounded hottie the MC must nurse back to health all wrapped up in a Gothic package of goodness? YES PLEASE! Have I ever mentioned how much I love Cleopatra? She's one of those historical figures I love reading about and a tiny part of me always wishes she doesn't actually die in the end even though, yeah, that wouldn't be very historically accurate. Anastasia Romanov is another historical figure I enjoy reading about and wish didn't die. I'm ready for some post-apocalyptic fun! They're never as smart as they should be when it comes to survival situations though. Maybe Mike Mullin will be different. She had me at "Mythos Academy--a school of myths, magic and war­rior whiz kids" Um, YES! Spartans, Amazons, Valkyries, psychic abilities...it just keeps getting better and better. I read the first two chapters on the author's website and I was hooked, so I'm so happy to have gotten a copy for review! Thanks so much to Kismet and Josephine Angelini! I will be participating in a blog tour for Starcrossed, so be sure to come back on June 1st for an opportunity to win some really awesome prizes (and read my review)! I really liked this book. I'm not sure about zombies, but I'm willing to give them a shot seeing as how I don't need to imagine them as a love interest in this series. Kissing zombies? Eww. But following a bunch of lady zombie slayers? Ok, I could do that. I have no purist qualms about mixing up Jane Austen either. I've also read another book (Holmes on the Range--yes, that's Sherlock Holmes) by Steven Hockensmith that I enjoyed a lot, so I'm looking forward to reading something else by him. A ghost has been committing murders and raising an army of wraiths and only Emma and her fellow ghost keepers can stop him! I loved the first book and this was a solid followup. Wow! Post-apocalyptic world, a hot guy, and one tough chick. I couldn't stop reading Enclave and when it was over I couldn't stop thinking about it. Ok, this is my guilty pleasure series. They're total fluff and they're outrageous like a soap opera. Seriously. Think of every soap opera stereotype (comas, parentage discoveries, wealth, backstabbing, high profile court cases, murder, blackmailing, etc) and it's here. The series is about a deep as a puddle, but it's addictive fun. I've had this book on my TBR for a while, but it was Krystle's review that inspired me to grab a copy when a library patron dropped it off. It left me in tears--beautiful, heartbreaking, wonderful tears. Wow, I LOVE this book! Fractured fairy tales and sweet romance. Loved the first and I've heard the second is even better! I WoWed this book a few weeks ago and I was met with a deluge of emails from you guys offering me your copies. How awesome are all of you? Totally and completely awesome! Or, erm, how sucky is this book? Haha, well, I guess I'll find out now! This copy came from the ever-awesome Ruby from Ruby's Reads. From Beneath Shining Stars, I Read! From Books from a Shelf! Um, I have a sickness. Seriously, you know how I feel about fairies, right? 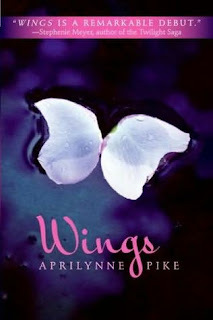 So what is Wings doing in my mailbox? And 13 Little Blue Envelopes? I've already read it and I didn't exactly like it. But they were free! Yes, I have a bad, bad compulsion to grab and hoard all free books that I might in some way or at some time like. At least they' e-books so they're not taking up physical space. That's a good enough excuse, right? I've already read this book. It was a cute book that didn't knock my socks off, but I'm happy I read it. Definitely give it a download if it's free for you. 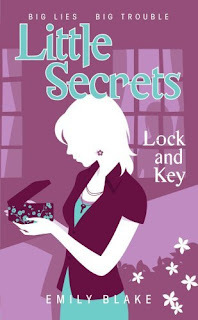 I actually do want the Little Secrets book! Every book ends on a gigantic cliffhanger a la Pretty Little Liars so I was getting ready to place an order for book 6 through inter-library loan in preparation for finishing book 5 when I discovered book six is apparently very hard to find. None of my libraries carry a copy and all of my trusty book sellers don't have a copy to buy either. Luckily the publisher has made this book available for free download on their website or I'd be ripping out my hair. I've been meaning to buy this book ever since I read it last year, but I never got around to it. It was on sale recently for $6.80 for a hardcover so I snatched that sucker up! This one's for you! You can click HERE to enter the giveaway if you haven't already. Wow you sure did get alot! The first 7 books I have never heard of, but all the covers are breath taking! What a mailbox! Wow there's so many great books that I'm not sure if I can pick one out to comment. Hope you'll get a chance to enjoy all of them and congrats on your wins. SO MANY BOOKS!!!!! Oh my gosh! You got so many for review and you won so many as well! Ahhh, I don't know how you're possibly going to read all of them. Haha, I know you could do it though :) Can't wait to hear what you think of them all and great mailbox! Paranormalcy?! I freakin' LOVE that book! (: I believe you do too if I'm not mistaken. You're so lucky to get Ashfall. I've been wanting that book so bad since I heard about it. I hope you enjoy it! I would like to read the Cleopatra and Lost Crown books. I've been interested in Anastasia since playing the Shadow Hearts 2 video game. um wow, I'm just glad you stated this is about a months worth or I would have had some serious book envy (but also sympathy because that is one MONSTER reading pile!). So many lucky books, but I'm most excited to read touch of frost! Enclave was great! Looking forward to you thoughts on Plain Kate, love that cover! So many of these are on my TBR. What a haul! But, I guess it's a whole month's worth of reading. I loved The False Princess. And Paranormalcy, what an awesome book! Inside Out was good -- although I figured out a lot of the "secrets" in that book pretty early on, leaving me annoyed with the characters for being too dumb to figure it out. On the other hand, it was one of those books that as soon as I read it, I immediately put every other book Maria V. Snyder had written on my TBR. If you love stories about Anastasia, you should read Anastasia's Secret by Susanne Dunlap, it's 100% wonderful! I can't believe you got a copy of the Magnolia League! It was sold out at the Book Depository and hideously expensive on Amazon, gosh, I hope you like it! 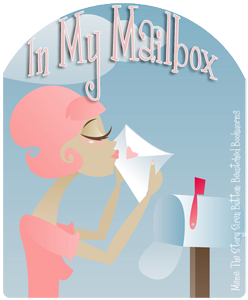 Then you can post a review and I can mither a little more about it, lol. :) Jessica's Guide to Dating on the Dark Side is superb, but you'll need to read at least half the book for it to 'click'. Gosh, it's a briil read. Anyway... have a great week and enjoy your reads! Wow chick! You got the mother load this week! Yay!! Quite a collection! I got Lost Crown this week too. And I loved Revolution and Paranormalcy. EPIC WINS! I'm so happy for you! Cleopatra Confesses looks good too. Revolution was amazing. I hope you like it. Oh man, this is an awesome haul. I think you'll like Plain Kate. And how did I get to be the first person who offered you a copy of Generation Dead? Guess I'm just that lucky. Woah, that is a massive IMM (even covering several weeks!) I quite enjoyed Paranormalcy and found How to Take the Ex Out of Ex-Boyfriend to be a cute read :) Glad to hear you loved Enclave too - I was very impressed by it! Good Lord Small! How are you going to read all that? But what great reading fun you'll have!! Aww! I'm so glad you liked my review. I loved Plain Kate! It's so fabulous. XD. And don't worry. I download books if they're free too, even if I didn't like them. Haha! It's FREE! You got a GREAT haul! Wow! You got a little bit of everything this week. I got some of the same books too, lol. Awesome loot for this week! Jessica, Of the first seven books, I’ve only read Cascade so far, but it was so good! They do all have really pretty covers. T. B. Haha, I don’t know either! Even more pressing is where am I going to put all of them?! I’m running out of space! Rita Renne, You’re right, I love Paranormalcy too! I almost forgot about Ashfall, actually. I hope it’s good! Bookish Hobbit, I know, I thought of you as soon as I saw those titles. I got them both through Simon and Schuster’s galley Grab if you want to see if you can get them. Celesta, LOL, yeah, this isn’t even the half of my reading pile. And I just keep ordering more through the library. I think I need a support group. :P I’m really excited to read Touch of Frost too! Have you read the two sample chapters? Blueicegal, I agree, I loved Enclave! Plain Kate was so beautiful. I’ll have a review up in a bit, but I totally recommend it, especially if you like fairy tales. The Slowest Bookworm, Haha, yes! I’m not sure about zombies either, but I am curious and willing to give them a shot. Especially when they’re getting killed. Madigan, I’m really looking forward to reading The False Princess. I love Paranormalcy. That’s the book I give to aspiring writers when their “voice” isn’t very YA. I hand them Paranormalcy as an example of what works. I’ve only read Poison Study by Maria V. Snyder, but I loved it so much so I’m really looking forward to checking out Inside Out. Haha, I know what you mean about being annoyed with the characters for not figuring things out quick enough. I’m experiencing that now with my current read. The BookHour, Ooh, I have Anastasia’s Secret on my TBR. Thanks! I got a copy of The Magnolia League through Net Galley. I really enjoyed Jessica’s Guide. I wasn’t expecting much, but I was pleasantly surprised by how much I liked it. Bookish Brunette, I really did! But at least it’s for a month. Stephanie, Thanks! I think I’m going to save Revolution for later since I’ve heard it’s kind of sad. I hope I get to read Cleopatra and The Lost Crown before they expire! I think I should be able to get to Cleopatra, but The Lost Crown I’m not so sure about. It’s really long, too. I think I’m going to read The False Princess next. Alison, I can’t wait to see what you think of The Lost Crown! Revolution seems so well liked, and I love Paranormalcy. 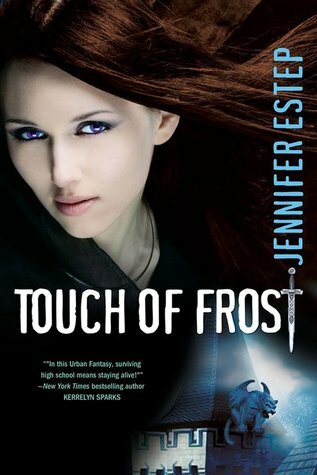 Dazzling Mage, Yup, Touch of Frost is her new YA series. I think it comes out in July. Have you read her adult books? This will be my first book of hers. Danya, It really is massive. I think I may be a little intimidated. :P Good to know about How to Take the Ex..! I loved her My Fair Godmother and Alls Fair in Love, War, and High School. I really was impressed with Enclave, especially considering how picky I’ve been lately with all these YA dystopians coming out. Enclave definitely stands apart. Heather, Haha, over a very, very, very long period of time :P The bigger question is where am I going to put all of them?! Alex, Aw, I hope you love Athena the Wise. I’m really looking forward to it because she’s my favorite GG so far. I’m reading Artemis the Brave right now. Yes! I’m so glad you liked The False Princess! I think I’m going to read that one next. I’ve been waiting for it to come through inter-library loan for months. Wow! MAJOR haul this week! Paranormalcy was such a sweet, fun read =D A friend is reading Starcrossed right now, and she legit wants to MARRY that book, so I am moving it up my TBR pile! Hope you enjoy your new reads! Casey, It really is a huge amount of books, but at least it’s for a whole month practically not just one week. I loved Paranormalcy! Definitely move Starcrossed up your TBR. I liked it a whole lot! Julie, Haha I sure did! I’m reading Cleopatra Confesses now and I’m liking it a lot. It’s definitely for historical fiction fans, but it’s very readable and combined with the short chapters I’m flying through it. Diana, Never too late :) I really liked Starcrossed. Definitely get your hands on a copy when it comes out!